Michael Shaw's outstanding blog, BagNewsNotes, is featuring the work of photojournalist Lori Grinker. In response to an inattentive domestic media and the lack of visual documentation, Lori Grinker has been pursuing the story of Iraqi civilians fleeing the war. 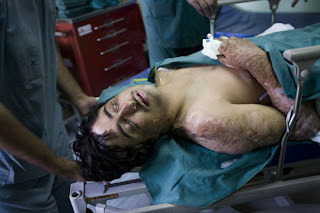 In the case above, the young man (call him Amer) was burned in an explosion while walking past a fuel truck in Baghdad. We see the 16-year old coming out of the recovery room after having surgery to fix the contracted fingers on his right hand. He faced the same surgery on his left hand a couple of month later. I encourage you to see Lori's work being featured at 'The Bag,' as well as at her own site. Thanks very much for your comment, Wasim. Very moving. I have also not posted here in a long time, even though I posted a diary based on this model almost each day at DailyKos, MyLeftWing, and Booman Tribune for a little over 2 years. My posting dropped off last year at about this time when Kos noted that he needed to apply strict controls on the use of copyrighted materials. That's when I moved to this site. My wife had the first of two surgeries last March (she's doing great), and my posting here dropped off even more so, down to what you see now. I fell out of what had become an important part of each day - to search wire service photo archives, and to browse poetry sources. Those times were as you describe: an opportunity to be still, and to try to understand, in some small way, the burdens of others. I've told myself before that I need to get back into this practice. Perhaps your thoughtful note is the reminder that I need to do so.